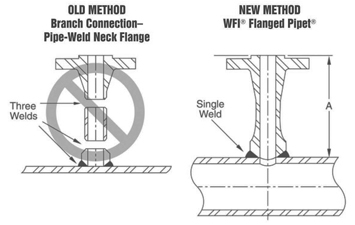 FLANGED PIPET® | WFI International, Inc.
Don’t waste time and money making 3 welds... when the single weld WFI® Flanged Pipet® performs better! FORGED ONE-PIECE CONSTRUCTION MEANS LESS WELDING. WFI Flanged Pipets are available in any length, material, pipe wall thickness and flange rating. WFI Flanged Pipets offer a simplified installation and provide more exacting tolerances where multiple flanges of constant height are required. One-piece construction eliminates two extra stress points and the clean, seamless bore offers better performance. 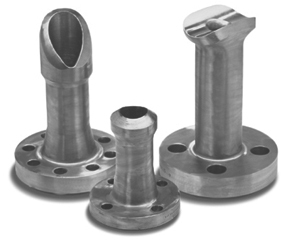 The base is contoured for attachment to a pipe, elbow or vessel.